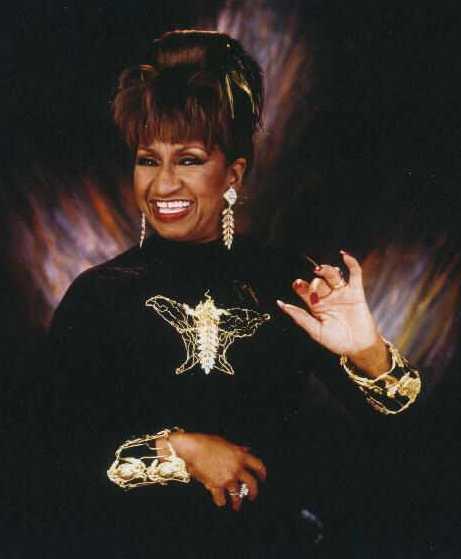 It is virtually impossible to imagine the world of Afro-Cuban music without the dynamic presence of its reigning queen, the one-and-only, Celia Cruz. Since the late 1940’s when she emerged in her native Cuba as one of the most exciting and creative interpreters of the mambo, Celia has been tropical’s music guiding light, its heart and soul, the very personification of the style celebrated around the globe today assalsa. Throughout a professional career that spans almost half a century; over 70 albums, Grammy Award winner and ten nominations, and historic associations with such legendary groups and personalities Cuba’s La Sonora Matancera and the King of Latin Music himself, maestro Tito Puente, Celia has nurtured a passion for the music and maintained a youthful, effervescent performance style that continues to captivate the hearts of salsa fans all over the world. It all began in the humble surroundings in the Santo Suarez barrio of Havana when Celia was born into a family of four children. A talent for singing came early, and by 1947, Celia had won her first prize for her talent on a popular Havana radio program. She also enrolled for formal studies at the National Conservatory of Music. After joining the legendary La Sonora Matancera Orchestra in 1950, she made her first recording and started to build a discography that in one time would produce over 20 gold albums and contain many of the most definitive Afro-Cuban recordings in the history of the music. Touring with the group from 1951 to 1959, she cultivated a growing international following throughout the U.S. and Latin America. Since 1961, Celia has been a resident of the United States, capturing the public’s attention through a fruitful, multi-album association with Tito Puente. During the explosion of interest in Salsa in the 1970’s, she scored critical and popular successes through artistic associations with Johnny Pacheco, Willie Colon and the Fania All-Stars. During the 1980’s and 90’s Celia’s enduring fame and singular abilities as a vocalist led to new and challenging collaborations with such diverse artists as pop singer and Latin Music fanatic David Byrne, salsa guru Ray Barretto, and two of Miami’s most revered tropical music figures, Emilio Estefan and Willie Chirino. Symbolic of her stature, Celia has often been sought out for cameo roles in films, including “The Perez Family” and “The Mambo Kings”. Along the way the Queen has received more than 100 awards from prestigious institutions and publications around the world, including an honorary doctorate from Yale University, a star on the Hollywood Walk of Fame and recognition from The National Endowment for the Arts. And, as evidenced by her characteristically energetic and zesty performances on such recent RMM albums as “Irrepetible“, “Azucar Negra” and “Celia’s Duets” it is easy to understand why Celia has been compared to such legendary jazz vocalists as Ella Fitzgerald, and Sarah Vaughn. Her singular abilities continue to define the artistic dimensions of a musical genre she helped create half a century ago. “Music is a gift that was given to me by God,” she says with true conviction. “Unless He takes it away, I will continue to share my gift with the world.” And the world is eagerly awaiting her next album or next live performance. The fabled “Guarachera del Mundo” is truly the Queen, a figure who continues to bless the spirit of modern tropical music with boundless creativity, sincerity and joy of life.